What would you do if you saw somebody standing at the top of a skyscraper, about to jump? Would you avert your eyes in horror? Would you watch in dismay as they plummeted to the ground? These are similar to the thoughts that are going through my mind as I watch Republicans begin the process of capitulating to a tax increase as part of the Supercommittee process. Indeed, this is one of those moments when I desperately wish I was wrong. I warned back in August that the Supercommittee was a tax increase trap. Republicans have this lemming-like instinct to jump off the cliff, even though they get taken to the cleaners every time they agree to real tax increases and get make-believe spending cuts in exchange. Here’s a depressing paragraph from a recent Washington Post story. Tensions have mounted in recent days as two of the GOP’s most fervent anti-tax stalwarts on Capitol Hill — Sen. Patrick J. Toomey (Pa.) and Rep. Jeb Hensarling (Tex.) — have lobbied party colleagues behind the scenes to forgo their old allegiances and even break campaign promises by embracing hundreds of billions of dollars in tax hikes. What makes this potential sellout so disturbing is that every dollar of tax increases will enable another dollar of wasteful spending. Here’s what George Will wrote in his latest column about the GOP’s foolish naiveté. Although only 21 of the 242 Republicans in the House and eight of 47 Republicans in the Senate were on Capitol Hill in 1990, everyone there should remember the results of that year’s budget agreement, wherein President George H.W. Bush jettisoned his “no new taxes” pledge: Taxes increased. So did spending. And the deficit. Economic growth decreased. So why are Republicans thinking of repeating this mistake? Well, there’s no good answer, but the most commonly cited reason is that they have been misled into thinking that the alternative result – automatic “budget cuts” known as sequestration – is too harsh. This is an absurd line of reasoning, in part because it is blatantly inaccurate. The supposed “budget cuts” are only reductions if one uses dishonest Washington budget math. 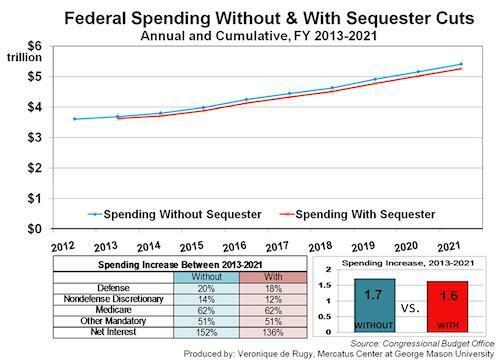 For those who rely on real-world numbers, total spending will climb significantly even if the sequester occurs. Here is a chart that was part of an excellent article by Veronique de Rugy of the Mercatus Center. It shows that spending – including defense spending – will increase regardless of what happens. The only issue is whether members of the Stupid Party agree to a tax hike so that the burden of federal spending can climb even faster. The Washington elites want a deal so they can transfer more money to Washington. For American taxpayers, however, the only good conclusion is a Supercommittee deadlock, followed by a sequester. ….and this is goal of the Republican Party. Once in DC, they fight for their own power and money and let the citizens ‘go hang.’ The bigger question is: when will the members of the Stupid Party begin to join the Libertarians to force DC to stop spending….until the complainers about how things run in DC get serious about changing the environment, by supporting neither the Dems or the GOPs but turning to the Libertarians, nothing will change…see 1980-2011. A lot of people like to talk about how successful the 1987 tax reform was – got rid of many deductions and lowered rates. And it was successful. But there was another lesson that they don’t like to talk about. Remember your deduction for interest paid? And for sales tax paid? All gone. But what happened just 6 years later? Clinton made sure the rates went back up. Did your deductions come back? Don’t be silly – of course not. Always remember this – the dems are always wanting to jack up rates. This applies to Cain’s 999 plan too. The Republicans are urging the end of deductions for mortgages, charity, and state taxes. Sound sane to you? Deductions never reappear, tax rates just go up. There isn’t a nickel’s worth of difference between the Dhimmies and GOP,. The GOP is driving us to hell, just more slowly. Pat Toomey was once the head of the Club for Growth PAC. I can’t understand why he would betray his fiscal conservative principles. The Repubs intend to drive us off the same economic cliff but with a different driver, and perhaps to approach the edge at a slightly slower rate of speed.